Apple Senior Vice President Eddy Cue says that Cupertino will lean on the newly-launched iTunes Radio to enhance discoverability for albums that make their streaming debut on the iTunes Store. 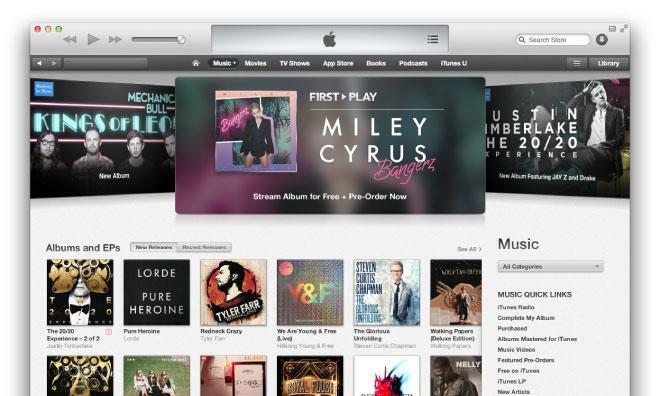 Miley Cyrus's Bangerz is the latest album to makes its debut as a stream on iTunes. Apple plans to leverage their new iTunes Radio service to make it easier for customers to discover streaming album debuts, iTunes boss Eddy Cue said to Entertainment Weekly on Monday. Cue was speaking to the magazine about the just-finished iTunes Festival in London. Asked how much influence the success of streaming debuts had on iTunes Radio, he said: "We certainly knew we would leverage it for iTunes Radio but the primary key to iTunes Radio was to create it custom for you. When youre talking premiering song, what were doing iTunes Festival-wise, we knew iTunes Radio was a perfect place for that so its perfect alignment." Record labels are choosing to stream albums ahead of their official releases in part to combat leaks, but data shows that the streams also have significant impact on album pre-orders. One music industry insider told Billboard that albums "often see a two-times to five-times bump in pre-orders during these campaigns." Two of the biggest album debuts of the year, Justin Timberlake's The 20/20 Experience and Daft Punk's Random Access Memories, were streamed on iTunes prior to their release. For his part, Cue feels that iTunes Radio is a much more natural platform for the debuts than the iTunes Store. "Its a huge improvement to do it on iTunes Radio because you dont go to a store a lot. Hopefully lots of people will be listening to iTunes Radio a lot; from a discovery perspective its significantly better," he said. "I think when you go to a store and you go to the Justin Timberlake page and stream it from there, thats great but that means you went to the store. iTunes Radio lets you discover it without you having to think about it."